There are quite a few variations in specification of stainless steel liner and methods of installation, all of which may meet minimum standards but can affect both the performance of an appliance and the longevity of the liner. The notes below explain why we specify our "Premier Package" liner installations as we do. Manufactures offer a range of warranties on their liners from 10 to a ridiculous 30 years, & in our view the best manufacturers only offer warranties at the more realistic lower end. Retains heat in the flue for longer, resulting in much faster start up times. Back-filling the cavity with insulation will stabilise the flue stopping it moving around when it is being swept therefore lessening the chance of the sweep puncturing it or splitting it. Providing a barrier between the liner and corrosive material on the sides of the old flue will help preserve the liner. Twin Wall Liner Both inner and outer layers made from corrosion-resistant 316L stainless steel. 904L stainless steel is also available as an option for the extreme conditions found with appliances like slumbering stoves. Insulation between the liner and the chimney: Most fitters do not insulate by backfilling the cavity between the existing chimney and the new flue liner with vermiculite when fitting a liner; however we believe this is an important factor influencing both performance of an appliance and longevity of the liner. We advocate insulation of the liner wherever possible. Method of liner manufacture: all flexible liners are manufactured by folding strips of stainless steel to make a flexible tube. The strongest and most durable is triple lock. All our solid fuel liners use triple lock construction. Other methods can produce a cheaper liner but the strength is impaired. Which can result in splitting during installation, or early failure after installation if it is under stress. Grade of stainless steel: stainless steel is graded using a numbering system which identifies the proportions of nickel and chrome content. The 2 principle grades used are 316 & 904 grade, the 904 being much more expensive (often twice as much as the 316 grade) but also much more resistant to corrosion. We have made a decision to offer 904 grade as our premier choice for customers. The reason for this is that manufacturers are downgrading their warranty periods and installers have been experiencing a huge increase in warranty claims. We believe the reason for this is that most previous experience in the industry has been with open fires, however the huge growth in re-lining for stoves is where the problems are occurring. The main difference between fires and wood burning stoves is flue gas temperature. An open fire has a very high flue gas temperature, while a stove which is more efficient has a low flue gas temperature. This low temperature is more likely to result in condensation of the flue gases against the side of the liner (sulphuric acid condenses at 150??C). This condensation is a big problem as acid attack is accelerated massively in the presence of water (which is one of the by-products of combustion). There are further corrosion issues related to the type of fuel burnt, we would only advocate burning properly seasoned (untreated) wood or anthracite (very pure deep mined coal). We recommend that household coal and processed smokeless fuels should not be burnt on a stove due to their high corrosive properties on any liner, if you are planning to burn any processed smokeless fuel, on either an open fire or stove, we would only recommend 904 grade liner and then still advocate a change to anthracite. Liner warranties are only associated with the value of the product itself and are pro-rata warranties with a host of exclusions relating to type of fuel used, and frequency of maintenance. If you have a liner with a 10 year warranty and it fails after 5 years the manufacturer will supply a length of liner at half trade price. We believe this makes nonsense of any manufacturers warranty and so endeavour to install to a specification where the warranty should not need invoking. Corrugated outer skin for high crush resistance. Extra smooth inner skin allows for easy drain down of condensates, less opportunity for soot to collect in the joint area and ease of sweeping. Engineered joint design gives extra strength and flexibility. Inner skin remains smooth and protective even after the rigours of installation. Made from corrosion-resistant 316L stainless steel. Leak resistant construction due to dovetail folded seam. Deep corrugations for high crush resistance and better flexibility when installing. Strong seam construction resists the rigours of pulling the liner into place during construction. For relining existing chimneys to take gas, oil and multi-fuel appliances including stoves & open fires. 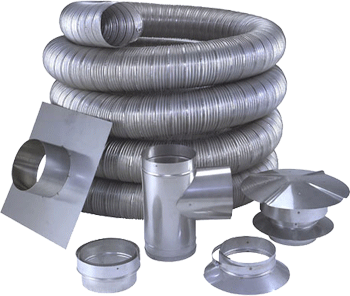 ApplicationFlexible flue and chimney liners designed for lining an existing flue or chimney. Gas Flex is a single wall stainless steel flexible flue liner designed for atmospheric gas and kerosene appliances where the flue gas temperature does not exceed 260??C. Diameter range 100 - 500mm. Twin Flex is a twin skin flexible chimney liner designed for gas, oil and multifuel, where the maximum flue gas temperature does not exceed 600??C. Diameter range 80 - 300mm. Pete The Sweep ?? is a registered trade mark.